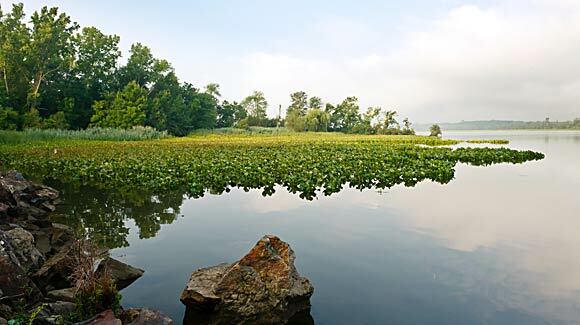 In December 2010, Scenic Hudson protected 74 acres of hilltop property along the Hudson near Olana. The property's 1500 feet of Hudson River shoreline provides critical wildlife habitat.Robert Rodriguez, Jr. The generous donation of a conservation easement on this hilltop property along the Hudson River—once part of the Livingston family's historic Oak Hill estate—by new owners Allan and Julie Shope protects land integral to preserving magnificent views from Olana State Historic Site, ensuring that the 170,000 annual visitors to the home of 19th-century painter Frederic Church still can admire vistas that inspired some of his most renowned works. A top regional tourism destination, Olana generates $7.9 million of economic stimulus each year in surrounding communities. The acquisition guarantees that much of the wooded property and 1,500 feet of Hudson River shoreline will continue providing critical wildlife habitat. It also safeguards shorelines along Foxes Creek, which flows through the property. In addition, the landowners have the right to build a single family residence and to use 23 acres of forested land containing prime farmland soils for agricultural purposes.